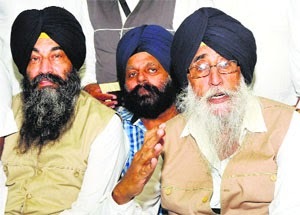 MOGA, Punjab (October 22, 2014)—President of Shiromani Akali Dal (Amritsar) Simranjit Singh Mann expressed deep concern about the explosive conditions being produced in the Punjab by RSS and other communal organizations. “Firing by the Pakistan border depicts the weak roots of the Hindutva Emperor,” he added. He declared the activities of Hindutva Emperor responsible for its weakness. Operation Blue Star in 1984, the November 1984 Genocide, the Muslim Genocide in Gujarat, and the depopulation of Sikh farmers in Gujarat all departed these minorities from Hindutva, making it weak. He said this Emperor is now unable to fight with Pakistan and China. He said it is clear that these minorities will not favor India during the war with Pakistan or China, because they don not want war in their residential areas like Punjab, Rajasthan, Gujarat, Jammu Kashmir, Leh Ladakh etc. Simranjit Singh Mann informed that the martyrdom anniversary of Shaheed Bhai Beant Singh and Shaheed Bhai Satwant Singh (who retained the pride of the Sikh community by killing Indira Gandhi) will be celebrated on 31 October at Gurdwara Rakaab Ganj Sahib. He appealed to Sikhs to reach Gurdwara Rakaab Ganj Sahib to celebrate this martyrdom anniversary. He invited all the Sikh organizations to reach Gurdwara Rakaab Ganj Sahib while marching towards it. Manjit Singh Malla, Harpal Singh Kussa, Baba Amarjit Singh, Tarlok Singh Bhalla , Balraj Singh Moga etc. were present on this occasion.